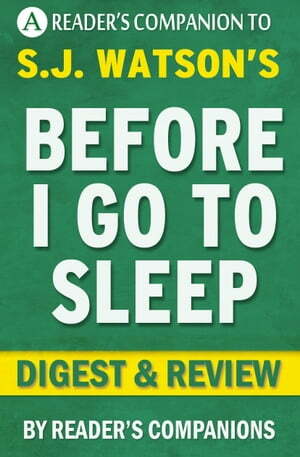 Collins Booksellers - Before I Go to Sleep: A Novel by S. J. Watson | Digest & Review by Reader Companions, 1230001206715. Buy this book online. Who do you trust? As Christine closes her eyes, she knows that all the memories she has collected today will vanish when she falls asleep. When she awakes tomorrow, she will have no recollections of today. It is the same every day; there is so much she does not remember? that she is married, how old she is, or even how she got to where she is. She believes she is still in her early twenties; she is not but she has no recollections from her past?no memories, no names, no people, nothing. Each day she has to start assembling her memories all over again. Can she trust the person who declares he loves her, the stranger lying next to her in bed? Is he really who he claims to be? Is she safe? This psychological mystery will keep you on the edge of your seat. This début novel is an exhilarating page-turner, and its thrilling climax will not disappoint.